A magical ingredient from my favorite childhood hamburger. 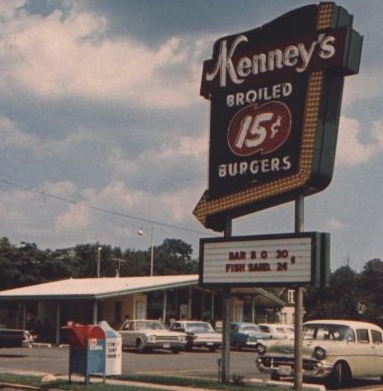 If you grew up in the Southeast during the 60's, 70's and early 80's you most likely had a Kenney burger. Soaked, slathered and marinated. The sauce is somewhere between ketchup and a tangy barbecue and you either really loved it or you didn't. No lettuce. No tomato. Bun, Meat....and Sauce. The crowning touch to a Kenney's visit was the fried biscuits. Lightly rolled in sugar and served with a couple packets of honey. Richard Petty and the guy with the big red shoes got punked...every time. I was in the military when Kenney's closed ('83 I think), and must confess I dont remember the very last one I ever ate. I was having fun back then, so that detail is one of many that perished in the wake of a young globe-trotting lifestyle. 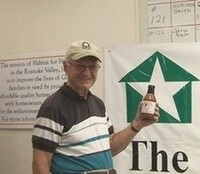 I had written that flavor off as gone, until my wife came home one day...with a bottle of Kenney Sauce. Autographed no less, by Bill Kenney himself. I spun it around, shook it well and then cautiously twisted off the cap. I waited for the bouquet instead of just jamming my nose into the bottle. It was correct. Using my index finger (north of the Mason-Dixon I believe you would use your pinky, or a spoon if your not the finger in the bottle type) to lightly graze the inner neck of the bottle, I bring just the essence to my lips. I have drowned many a burger since re-discovering "The Sauce" , and reworked my meatloaf recipe...adding it between the Vidalia onion, Mozzarella and fresh shredded Parmesan. I actually look forward to meatloaf again. You can pick it up at Kroger (Rio and Hydraulic I know for sure) and the occasional specialty shops.